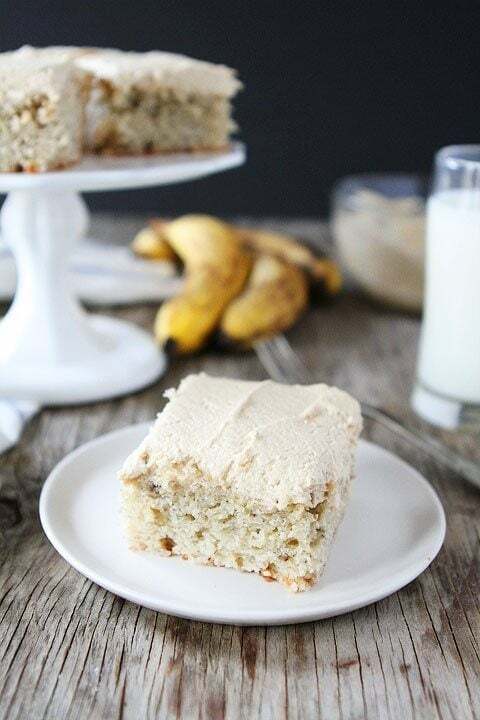 Banana Cake – this easy Banana Cake topped with creamy peanut butter frosting is absolutely delicious, and a great recipe for using up those brown bananas! Brown Banana Solution: Banana Cake! Oh, brown bananas why do you make me create such delicious recipes? Every time I see a bunch of brown bananas on our counter, I know I have work to do. I can’t let them just sit there. They need to be transformed into something tasty! 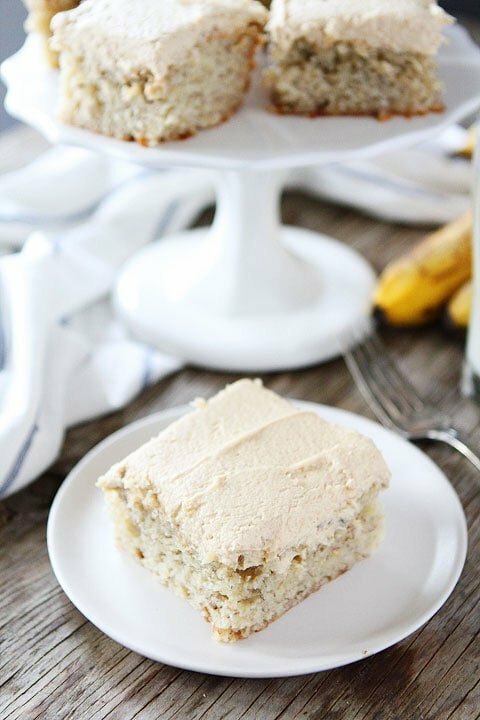 My latest bunch of brown bananas fell victim to this Easy Banana Cake with Peanut Butter Frosting. 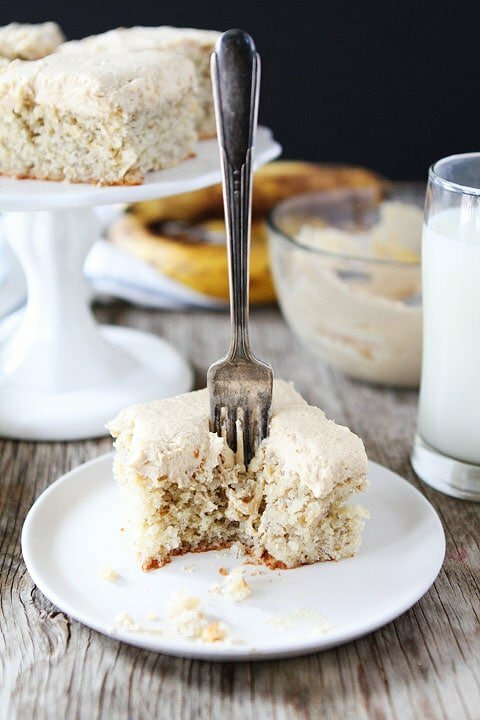 If you are a banana fan, you are going to go bananas for this banana cake. It is so easy and sooooooo good! 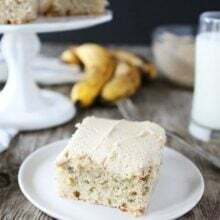 I love this banana cake recipe because we always have the ingredients on hand. I bet you do too! And if your bananas aren’t ripe yet, you can put them in a brown bag to hurry along the process. I know you want to make this cake ASAP! I also love this cake because there is nothing fancy about it. There are no bells and whistles attached to this cake. Thank goodness because I can’t decorate a cake for the life of me:) Don’t worry though, this cake still impresses. The cake and frosting are amazing on their own! Let’s take a moment to talk about the peanut butter frosting. I am normally not a huge frosting person but put a bowl of peanut butter frosting in front of my face and I want to dive in head first. I thought about not even frosting the cake, but I knew the wait would be worth it. I LOVE the banana and peanut butter combo! It is perfection. The cake is perfect the day it’s made, but I personally think it is even better the second day. The cake is even more moist and delicious! So if you need a dessert that can be made ahead of time, this is your recipe! Banana cake topped with creamy peanut butter frosting. The best way to use up your brown bananas! Preheat oven to 350 degrees F. Grease a 9x13 pan and set aside. In a large bowl, cream together the butter and sugar until creamy and smooth, about 3 minutes. Beat in the eggs, one at a time, then stir in the Greek yogurt and vanilla extract. Mix in the mashed bananas. Slowly add the dry ingredients and mix until flour disappears. Spread cake batter evenly into the prepared pan. Bake for 25-35 minutes, or until a toothpick inserted into the center comes out clean. Allow cake to cool completely. While the cake is cooling, make the peanut butter frosting. In the bowl of a stand mixer, beat the butter and peanut butter on high until smooth. Slowly add the powdered sugar, 1/4 cup at a time. Beat on high until powdered sugar is incorporated. Add the milk and vanilla extract. Beat until frosting is smooth and desired consistency. Frost the banana cake with peanut butter frosting. Cut into squares and serve. Note-store covered cake on the counter for 3-4 days. I think the cake gets better as it sits. Our food store sells the more brown bananas for a major discount…and I buy them every time I see them. I either bake immediately or freeze them for when I feel like it. Happen to have some now ;). YUM! How much butter goes in the frosting? 1/2 cup! Sorry about that! I updated the recipe! Ooh you are speaking my language with this combination. Love it! Love bananas and pb together! This looks great! The frosting directions say to beat the butter and peanut butter together but you don’t include butter in the ingredients for the frosting. How much butter should go into the frosting? Thanks! Sounds like the perfect cake for a small group meeting that’s coming up. I love that I can make it ahead of time. I updated the recipe. Thanks for catching that. You need 1/2 cup butter. I think I could just eat the frosting!! Yum!!! Love the cake! It always boggles my mind that the grocery store sells ‘not ready to eat’ bananas at a higher price while the ‘perfectly ready to use’ bananas are less than half price. Insane! Bananas store wonderfully in the freezer, inside their skin–no prep needed, and thaw pretty quick on my countertop. This cake looks yummy–and bananas and PB are such a great combo. Add a handful of mini chocolate chips and it’s the sprinkles on top of the whipped cream, you know? Just last night I was trying to think of what to make with some brown bananas I have- tired of muffins and bread. This is perfect!! Great timing. Banana and PB is my favorite lazy breakfast. I want this frosting so so bad. 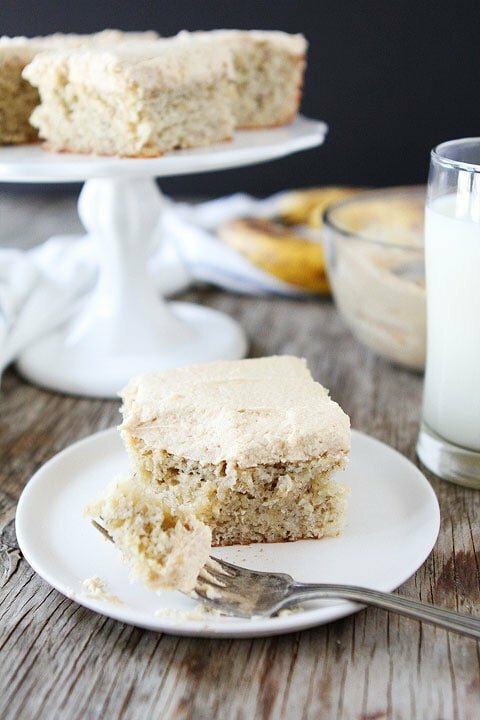 Peanut butter and banana is a perfect combo and it would be amazing in this cake! What a perfect cake! Great flavor combo!! A cake that gets better with age? 🙂 I’m all for it! oh jeez. just so, so good Maria! 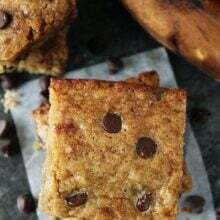 The perfect recipe to have on hand for when you have some brown bananas that need some lovin’!! Thank you for the nice recipe. A little different, but I’m sure delicious. Hi – this looks delicious, and I have some brown bananas in my freezer that I could use, but I was wondering if it could be made without the greek yogurt? I really don’t like yogurt and so I have none on hand. Or is there a substitution? What do you think? You can use sour cream. Can we use sour cream in place of the Greek yogurt? I love peanut butter and banana anything! Plus, an easy cake as decadent and delicious looking as this must be a hit! my mouth is now watering! The combination of bananas and peanut butter is pretty much my favorite thing. Love this cake! Yum!! Wow, this looks amazing! Always see (and PIN) your delicious food. I just pulled this out of my oven (so excited) but I wanted to just note that my cake took 35 minutes to cook before the toothpick came out clean. I live at 220 ft elevation in NorCal. Just an FYI. Thanks for the recipe! The universe is telling me to make banana cake or cookies or something. I have been craving it forever and now this. YUM! 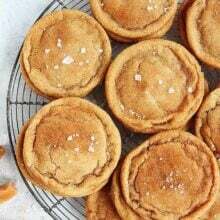 Hi..a few cooking queries from this Aussie girl..
Is all- purpose flour plain flour? And is sifted powered sugar icing sugar? Yes, use plain flour and icing sugar. Enjoy! Oooooo! 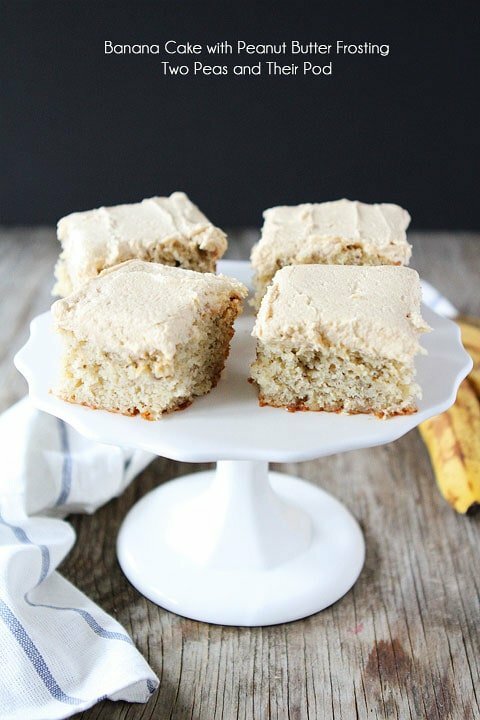 I’ve been making a banana cake like this for a little while, but never thought of pb frosting! Yum, thanks for the inspiration! Oh man. This looks so good. I’d pretty sure I could easily eat an entire cake’s worth of this on it’s own! And then you add a peanut butter frosting? Yep. Ridiculous. I just made this, Maria and it is AMAZING!!!! Love this! And I think it is fancy! This looks yummy. I am looking for more recipes that use greek yogurt and this sounds like something the whole family will like. The fact that it tastes better the second day is even better! Oh. My. Goodness. Made this recipe as muffins today (baked at 325 for 20 mins). They are seriously delicious! Perfect with a cup of coffee. The frosting is so addicting, I couldn’t stop eating it! This is a keeper, thanks so much! I seem to eternally have over ripe bananas sitting on my counter. I’m adding this recipe to my list to help combat the masses of black bananas! This cake looks heavenly! Such a delicious combo! Yum! 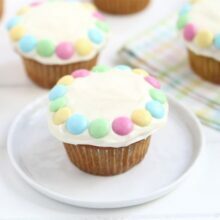 That frosting looks so fluffy and sweet! I made the banana cake this weekend for a family get-together and everyone enjoyed it. I found the peanut butter frosting just a tiny bit….bitter? I am no baking expert, so just wonder if it could be the vanilla, or even the confectioner’s sugar. Any thoughts? Thanks. oh my word. . this looks so delicious! Pinned and can’t wait to try! Made this tonight, had to sample the cake when it came out of the oven, delish! Looking forward to frosting it and sharing with my family tomorrow. Thanks Maria for another great recipe to use up those bananas! I made this last night. Brought it to work today. Everyone likes it. It has a lot of banana flavor. The frosting is very good. As someone above mentioned, it took about 30 minutes to bake in a 13 x 9 pan. If you use a sheet pan, it would take a shorter time. This is a great way to use up brown bananas. It would be awesome with cream cheese frosting, too. Made this cake last night and this will be my “go to” dessert recipe from now on!! So amazingly simple and delicious! Everyone raved about it and had to send them all home with slices! You have the best recipes, my FAVORITE site to go to for fantastic food! Thank you for sharing! I made this cake yesterday and its delicious!! I made a couple of small changes.. I didn’t have any plain Greek yogurt so I used sour cream instead. Then I added a cup of chocolate chips to the cake batter before baking because my husband kept saying it needed chocolate. It turned out great! This recipe is definitely a keeper! Can you substitute vanilla greek yogurt for the plain yogurt? Would you then just cut out the vanilla extract? Yes, I would leave the vanilla extract in still. I made this cake last night and I almost died, it was soooo good! I’d like to make this recipe as cupcakes for my son’s 1st birthday. Any suggestions (cook temp/time)? Thanks! I want to make this recipe but I wanted to make sure that “3 cups of powered sugar” in the frosting is not a mistake. 3 cups? Sounds like a huge amount. Thanks. I made this today, and my two younger boys gobbled it up! They can be quite picky. I too wanted something different than the usual banana bread. Thanks so much! You are welcome! I am glad your boys loved it! I made this again today, at least the fifth time. Still a huge hit! LOVE this recipe! Yay! It’s one of my favorites too! I made this a while ago and I came back now to post my review. It’s very delicious! I’ve made two of your cake recipes so far and they’ve been a hit. Looks like I’m sticking to this website for many more awesome recipes. Loved the recipe. Thanks for the recipe. I was very happy after reading the recipe. The recipe is very good. 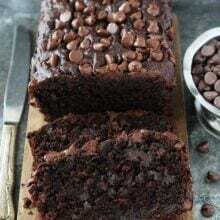 I really appreciate that you shared very delicious recipe. The banana adds a special flavor to it. At last i want to say that the overall recipe is very good and delicious. This cake was awesome. Made it for a family dinner and everyone loved it. Will definitely be making it again! Thank you for sharing the recipe. So happy you enjoyed the banana cake!